Get 25% off your first order at Bloom & Wild with our exclusive discount code. Click on ´Get Code´ button, copy the code, and visit Bloom & Wild website. Look for the perfect flowers for the one you love, and create your order. You can do this if you click on the flowers and choose ´Send Now´. You can log in or continue as a guest. Enter delivery details (recipient name and address), choose delivery date and service, and customise card message. Once you´re done, continue to payment. You´ll see an empty box where you can enter your special code if you have one. Enter the code and click ´Add´. The code will be applied and you´ll see a reduced amount of your order. Pay your order with your credit card or with PayPal. Once you have made an order through the Bloom & Wild website you can refer your friends by giving them £10 off their order. Once they have made an order you will earn £10 credit too. Good times! Bloom & Wild is the original letterbox online flower delivery company, that now offers a few other products, as well. 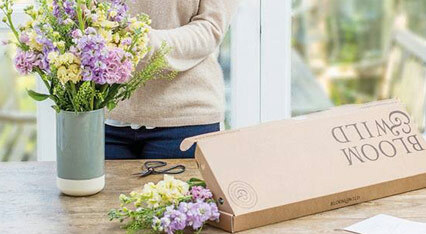 In addition to its original letterbox flowers, you can choose hand-tied bouquets or lux letterbox flowers. All flowers are packed by hand. The larger flowers are covered with a protective net, to ensure that they are delivered in perfect condition. Flowers are sent in buds so that they last longer. This also means they can be delivered through the letterbox, without the recipient needing to be there to receive them. All flower bouquets come with arrangement instructions and care tips. Valid on the first order only. Cannot be used in conjunction with any other offer. Not valid on workshops, subscriptions or delivery fees.